In this paper, we discuss strengths and limitations of different abstraction levels for distributed robotics experiments. We support the discussion with a concrete case study which has been investigated at four different levels: real robots, embodied simulations, microscopic modeling, and macroscopic modeling. 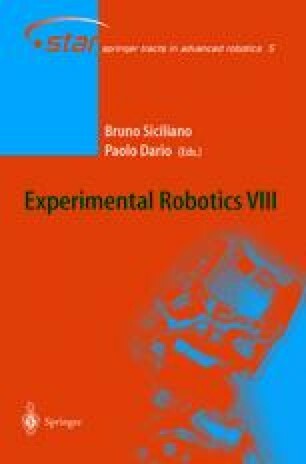 Both modeling methodologies presented represent the collective dynamics of the experiment as a set of stochastic events based on simple geometrical considerations and systematic tests with one or two real robots instead of computing trajectories and sensory information like an embodied simulator would do. The case study we describe is concerned with pulling sticks out of the ground - an action which requires the collaboration of two robots to be successful. Experiments were carried out with teams consisting of two to 24 individuals endowed with simple reactive controllers. In addition to showing that models can deliver both qualitatively and quantitatively correct predictions in time lapses that are three or four orders of magnitude smaller than those required by embodied simulations, we discuss differences, assumptions, and subtle numerical effects of the current modeling methodologies.